* Data for Quebec were not available at the time of analysis. ** Due to small numbers in the Territories numbers were combined. In the combined years 2014 and 2015, the rate of hospitalization due to asthma among children and youth in Canada, 2 to 17 years of age was 86.6 per 100,000 population. 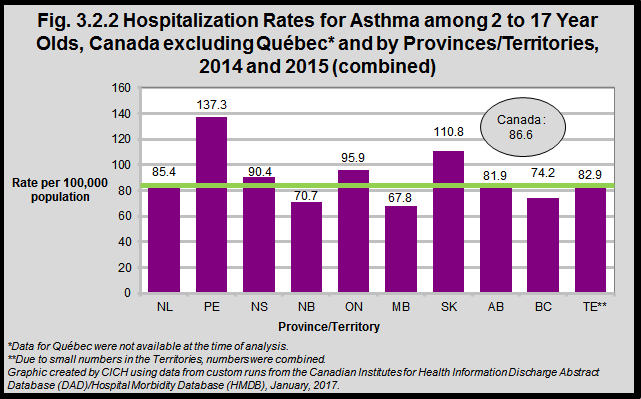 Rates of asthma hospitalizations were highest in Prince Edward Island (137.3 per 100,000) and Saskatchewan (110.8 per 100,000) and lowest in Manitoba (67.8 per 100,000) and New Brunswick (70.7 per 100,000). While differences in hospitalization rates may reflect access to timely and high quality care, these may also be related to differences in disease prevalence. This indicator does not include children with other lung problems such as those with chronic lung disease from prematurity.